Huawei, a leading global provider of ICT infrastructure and smart devices, held an Artificial Intelligence (AI) conference at their third annual Innovation Day on the sidelines of the ongoing Gitex Technology Week 2018 in Dubai, UAE. The event attracted industry experts and government leaders, including the guest of honour and keynote speaker, Mothanna Hamdan Gharaibeh, Jordan Minister of ICT, to strategize on the best path forward to bringing AI to the Middle East. Mothanna Gharaibeh said: “Investing in AI is an investment in the future. AI has the potential to solve many intractable challenges we are facing across industries today, by transforming the way we approach problems, and completing tasks more effectively and efficiently than humans can. It will also free people from spending our labour on tedious and repetitive tasks, allowing us to use our minds to engage in high-level activities. The Middle East is one of the first regions worldwide to import Huawei’s recently-unveiled revolutionary AI products and solutions. The AI conference was held just a week after Huawei Rotating Chairman Eric Xu announced the global launch of Huawei’s AI strategy, as well as its full-stack, all-scenario AI portfolio. Huawei’s AI portfolio includes its new Ascend series of AI chips – the world’s first AI IP and chip series designed for a full range of scenarios. The portfolio also includes new products and cloud services that are built on Ascend chip capabilities. 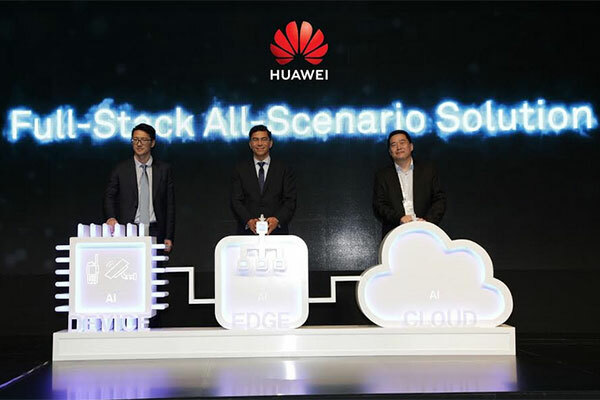 With its full-stack AI portfolio, Huawei aims to provide pervasive intelligence to help drive industry development and build a fully connected, intelligent world. Huawei predicts that by 2025, the world will see upwards of 40 billion personal smart devices, and 90 per cent of device users will have a smart digital assistant. Data utilization will reach 86 per cent and AI services will be readily available, as prevalent as the air we breathe. According to Huawei, AI has become a new general purpose technology and will change all industries and organizations on earth. Alaa El Shimy, managing director and vice president at Huawei Enterprise Business Group, said, “AI is on the verge of transforming industries and organizations across the world, and we are committed to helping our customers and partners make the most of the technology’s potential to unlock innovation and economic growth.